Okay, so I had a fun crossover idea--Greek mythology! A subject that has interested me for a long time. Out of the Twelve Olympians, I decided to represent six of the gods/goddesses with the mane cast of MLP, based on who I thought most fit each pony. 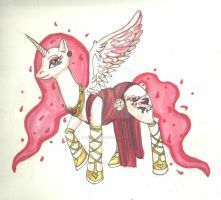 Twilight Sparkle here represents Athena, goddess of wisdom. The owl is her sacred bird, and she holds an olive branch in her mouth because Athena was said to give an olive tree to the people of Athens, thus becoming the city's patron. Very elegant imagery, Kate. I think you drew the way Twilight's dress contours to her form just right. One trouble spot I see is that the crest of her helmet looks to be in profile while her face is at a 3/4 angle. Oh dear! I believe I was trying to make it look more 3/4 angle when I was penciling it--this must not have carried over into the inking stage. Thanks for noticing, and thank you for the compliments!